A US-backed alliance of Syrian fighters says it has taken full control of Raqqa, ending three years of rule in the city by so-called Islamic State. Syrian Democratic Forces (SDF) spokesman Talal Sello said the fighting was over after a four-month assault. Clearing operations were now under way to uncover any jihadist sleeper cells and remove landmines, he added. However, a US military spokesman later said he could only confirm that about 90% of the city had been cleared. Islamic State (IS) made Raqqa the headquarters of its self-styled "caliphate" in early 2014, implementing an extreme interpretation of Islamic law and using beheadings, crucifixions and torture to terrorise residents who opposed its rule. The city also became home to thousands of jihadists from around the world who heeded a call to migrate there by IS leader Abu Bakr al-Baghdadi. How did the Raqqa offensive unfold? The SDF was formed by the Kurdish Popular Protection Units (YPG) militia two years ago along with a number of smaller, Arab factions. It says it is not aligned with Syrian President Bashar al-Assad or the rebels seeking to overthrow him. With the help of US-led coalition air strikes, weapons and special forces, SDF fighters have driven IS out of more than 8,000 sq km (3,100 sq miles) of territory. Last November, they began a major operation to capture Raqqa. They slowly encircled the city before breaking through IS defences on the outskirts in June. On Tuesday morning, the SDF cleared the last two major IS positions in Raqqa - the municipal stadium and the National Hospital. Reuters news agency reported that fighters raised the YPG flag inside the stadium, celebrated in the streets and chanted slogans from their vehicles. Dozens of foreign militants were believed to have made their last stand in the stadium, while 22 were reportedly killed in the final attack on the hospital. Up to 300 militants were thought to be holding out on Sunday, after Syrian jihadists and their families were evacuated along with 3,500 civilians under a deal negotiated by the Raqqa Civil Council and local Arab tribal elders. "Everything is finished in Raqqa, our forces have taken full control of Raqqa," Mr Sello told AFP news agency on Tuesday afternoon. "The military operations in Raqqa have finished, but there are clearing operations now under way to uncover any sleeper cells there might be and remove mines." Mr Sello said an official statement declaring victory in the city would be made soon. However, the coalition would only say that the battle was "near its end", with spokesman Col Ryan Dillon estimating that about 100 militants were left in Raqqa. What has been the human cost? There has been a "staggering loss of civilian life" in Raqqa, according to UN war crimes investigators. The Syrian Observatory for Human Rights, a UK-based monitoring group, reported on Tuesday that at least 3,250 people had been killed in the past five months, among them 1,130 civilians. Hundreds more were missing and might be buried under destroyed buildings, it said. The anti-IS activist group, Raqqa is Being Slaughtered Silently, said more than 1,873 civilians had been killed. Activists said many of the civilian casualties were the result of the intense US-led air strikes that helped the SDF advance, though the coalition said it had adhered to strict targeting processes and procedures aimed to minimise risks to civilians. 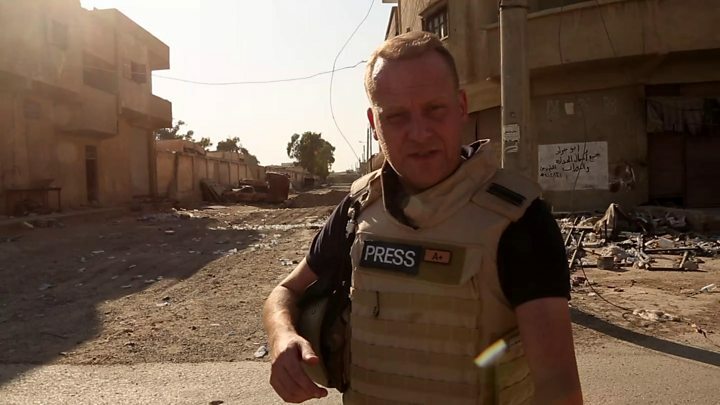 IS militants also used civilians as human shields and shot those trying to flee. The UN said last week that about 8,000 people were still trapped in Raqqa, and that almost 270,000 civilians had been displaced since April. 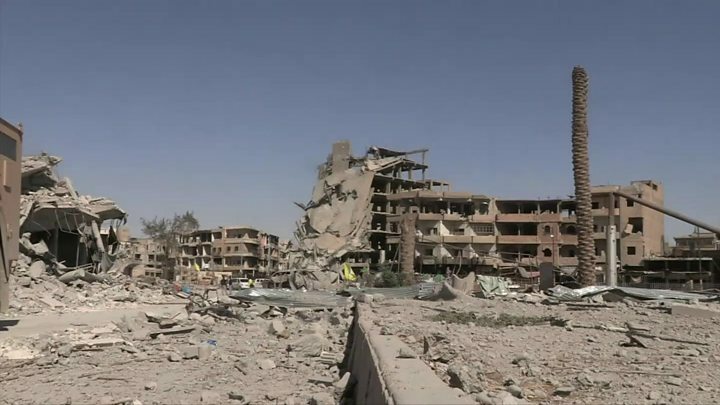 Air strikes, shelling and clashes on the ground have also destroyed Raqqa's civilian infrastructure and homes. A local councillor recently estimated that at least half of the city was destroyed. Where is IS leader Abu Bakr al-Baghdadi? Save the Children warned that while the battle was now over the humanitarian crisis was continuing, with the displaced in critical need of aid and camps "bursting at the seams". "Conditions in the camps are miserable, and families do not have enough food, water or medicine. But it is not yet safe for them to go back, and many of their homes are now turned to rubble," said the charity's Syria director, Sonia Khush. What is left of IS in Syria? The jihadist group still has a number of footholds, the largest of which runs along the Euphrates river valley in the south-eastern province of Deir al-Zour. However, the SDF and Syrian government forces - which are backed by Russian air strikes and fighters from Lebanon's Hezbollah movement - have launched separate offensives in the province with the aim of taking control of a key crossing on the border with Iraq. IS has also suffered a series of defeats in recent months to Iraqi government forces, who are advancing along the Euphrates on the other side of the border. The US-led coalition said on Tuesday that forces it supported had reclaimed 93,790 sq km of Iraqi and Syrian territory seized by IS in 2014 and freed 6.6 million people from jihadist control.